If Australia’s aggressive marketing of itself as all sunshine, surf and sand; red rocks, red dust and reefs has infected you, then a visit to the Border Ranges National Park is the most effective antidote. Because the ancient sub-tropical rainforests of Gondwana that clothe the sheer cliffs formed by the eroded caldera of what’s left of a massive shield volcano are so unlike anything else you’ll see downunder they’ve been World Heritage listed. On my first and only other visit to the Border Ranges National Park I could hardly walk thanks to a strenuous 9 km return hike the day before up Mt Warning – the volcanic plug in the middle of the Tweed Volcano, and first place to see the sun on mainland Australia. Other than a relentless climb, the walk was straightforward – until I got to the last 400m or so straight up the almost bare rock of the volcanic plug that forms the 1157 metre high summit! Although the real leg damage was done coming back down. That’s where I developed my revolutionary mountain-descent technique – a cunning combination of a death-grip on the chains that marked the track, and sliding down on the seat of my pants. I dare you to try it sometime! But it meant that the next day in the Border Ranges National Park, I only saw those attractions within easy walking distance from the car park areas. Now, nearly 20 years later, and with no major hikes under my belt from the day before, it was finally time to explore the park a little more thoroughly. We’d already entered a more remote section of the park and walked the Border Loop trail (see below) on one of Australia’s quirkiest road trips – the Lions Road – that cuts through the range to Queensland. But today, we were headed for the the main section of the Border Ranges National Park. On our first trip, we’d taken the Murwillumbah-Kyogle road from Murwillumbah for about 38 km to the southern entrance. This time, we were staying at Kyogle so we approached the southern entrance from the other direction, planning to drive through the park, exit via the western entrance, and return to Kyogle the back way. Although we’d woken up to a killer frost in Kyogle that morning, the fine winter’s day meant the dirt roads throughout the park were easily navigable and the walking tracks weren’t muddy! And yes, that IS noteworthy in case you’re wondering. Can you guess why it’s called RAINforest? While the park isn’t far from either Kyogle or Murwillumbah, it’s too far to backtrack for lunch. Stocking up with enough provisions to affect our fuel economy is easy when the awesome Kyogle bakery is just up the road from the Kyogle Caravan Park! It’s amazing how much bakery food you can eat in just one day, isn’t it? Or is that just us?!?!?! A few kilometres from the park entrance was the Bar Mountain picnic area and our first walk of the day. The Falcorostrum Loop – named for a rainforest orchid variety – winds through a large stand of Antarctic Beeches. But who cares about an old tree (or two) when there’s the shy Alberts Lyrebird watching from behind the ferns? Not Pilchard!! The staggering scenery from the three lookouts on the park’s eastern boundary on the edge of the escarpment are pretty impressive if the 1000m drop down to the Tweed Valley below doesn’t scare you rigid. I didn’t need any signs warning me not to stray off the paths – even if I wasn’t the world’s biggest coward there’s NO WAY I’d go near the edge without a railing between me and the drop off! 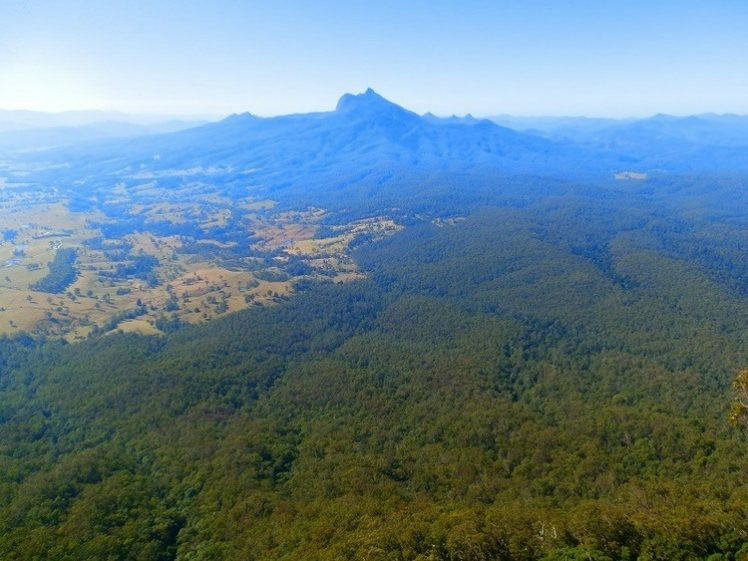 The Pinnacle Lookout is the centrepiece of the parks staggering scenery with a dramatic and far ranging view down to Mount Warning and the Tweed Valley. I chose to see the blue haze caused by smoke from a controlled burn in the distance as ‘atmospheric’ rather than ‘annoying’. It did give my photos a certain ambience, don’t you think?! After the lookouts, a one-way road loop – where you hope like hell that everyone else on the road a) reads the signs and b) follows them – descends into the Brindle Creek Valley, and the Helmholtsia Loop walk, named for a stream lily endemic to the region. This is World Heritage rainforest at its best, although it’s dark and damp under the canopy in a way that sunny South Australia with its wide open spaces isn’t. We didn’t get to see the view from the Tweed Valley Lookout at the end of the road loop – there was no warning on the narrow road and only a one-car parking bay that we didn’t see until we’d gone past. And yes, although it’s a narrow, winding, one-way dirt road, we could have just backed up – but that would’ve been WRONG! Never mind … the view from the road was pretty stunning. Although it was only mid-afternoon, the shadows were already long and the valleys dark – and the Sheepstation Creek camping area at the park’s western entrance was filling up. 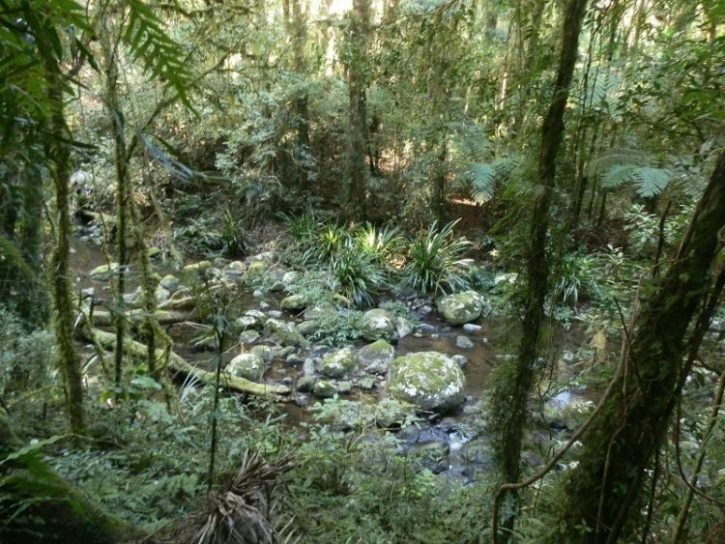 The Palm Forest Walk winds down the – yes, you guessed right – Sheepstation Creek gully amidst – yes, you guessed right – Palm Trees to Brushbox Falls following an old logging road with names and dates from people and times long past carved into the rocky walls. At what point does graffiti become historic art, anyway?!?! Once we’d returned to the campground, the smoke from the just-lit campfires giving pyromaniac Pilchard a little buzz, it was time to leave via the park’s western entrance. As we drove through more spectacular scenery outside the park boundary along the Lynches Creek Road to Wiangaree, then back to Kyogle the sun was setting behind the mountains. The evening winter cold was setting in too – it would be another frosty night. Driving to and from the park, sightseeing, hiking several of the shorter loop trails and vantage points AND eating the massive stash of Kyogle bakery provisions was a full day job. To hike any of the longer trails – ranging from 3.5 to 10.5 km – staying at either Sheepstation Creek or Forest Tops campground would have been a better option. But I’ll save that for my third visit! I enjoyed your post and all of the pictures! It’s good to be reminded of the wonderful ecological diversity that you have in Australia! Hi Christie! I’ve been all over, and I still find things that amaze me!! It’s such a pleasure to hear that you appreciate the photos – recording what I see is part of the fun of discovery, and the other part is sharing it! Have a lovely weekend! Wow, what a fabulous adventure! Love that you are sharing it! Thanks Lizzy!! Hope it inspires your travels one day!! It’s right in the middle of macadamia country too – that MUST count for something!! My goodness! Those pictures are just stunning! But I think for your next book, you should photograph the bakeries you visit on your trips. You know–*cough* For the pastries! Hahahaha, you’re a funny lady!! There’s little chance a pastry from the best bakeries would survive long enough to be photographed!!!! I do have a nice series of pix of plates with crumbs on them though 😀 But thanks for at least thinking I’ve got another book in me!!! G’day Red! 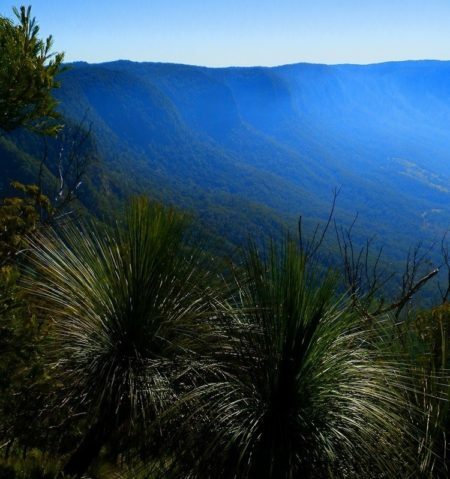 Border Ranges NP – fabulous spot!! my meagre little faded pics don’t hold a candle to your fabulous images! Love Murwillumbah too. Yep, coming down is the worst thing! A couple of times in my hiking life the old knees didn’t work for a couple of days after a particularly difficult descent. Have to say, I like your technique and might borrow it. Kyogle Bakery – it’s in my notebook now! Haha, I’m glad I’ve converted you to my revolutionary mountaineering style, Rose! But Anyou’ll probably have more luck with the Kyogle bakery!! 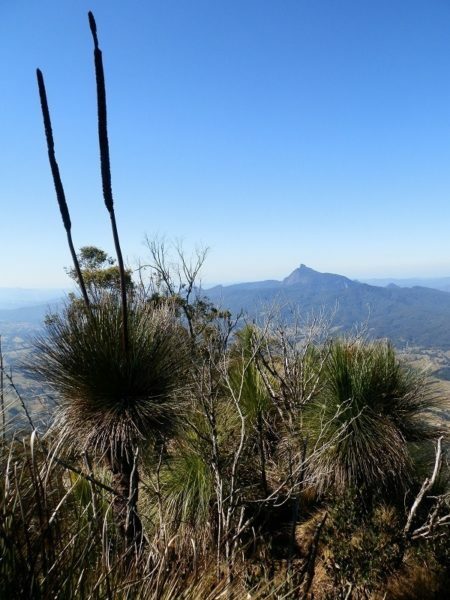 Murwillumbah is also a favourite of ours – what a shame I always associate it with the pain of descending Mt Warning! Happy Australia Day! Awesome tree trunk, we of course have those in the Styx Valley here in Tasmania, they also look awesome. Great view to Mt. Warning. Thank you M! I hope to see the Tasmanian version one day – so far, EVERYTHING I’ve seen in Tasmania is awesome! We’re so lucky to have so much variety downunder!! It looks a lot like my imaginary version of Faerie Land. A perfect getaway spot and with a nearby bakery too! great post as always Red. I just love your writing style. I am glad though that you included a link to the Border Ranges National Park on the NSW web site, so I could see where the park is. It looks stunning. One day I hope to get there. Though I might give the climb up Mt Warning a miss – perhaps the name is a warning! I definitely don’t think these old knees would cope with that one. AAARRRGH! I knew I’d forgotten something … the details of where the park actually is! FAIL!! It IS stunning – there’s almost TOO much natural beauty, if that’s possible. And Mt Warning? P & I use it as an ‘age’ test ie if we can climb it, we’re NOT old. Tragically, the last time we did climb it was about 15 years ago … read into that what you will!! I enjoyed your photos of the tree roots. The tree roots were almost the best thing, Yum! In terms of photography, anyway! Beautiful! And not too far from where I live on the Gold Coast. I have to get our more and explore these wonderful places! Haha, Bob! Apart from Pilchard and I, you mean??!! Take me with you!!!! Your trek is fantastic! And so is that bird….congrats. I really appreciate you sharing with me the wonders of Australia. This looks like a very memorable place to visit:) Love your last collage of plants and the one with the bromeliads and ferns. Pretty impressive stuff! I know my lyrebird pic is pretty crappy, Chris – but it was such a thrill to see it! They’re not that common and often all you get to see is their back-end as they disappear into the undergrowth! I’ve used my mountaineering technique many times since then, Iris! I don’t care if people laugh at me!!! And where were the chains in the Flinders Ranges? ?